The Federal Aviation Administration called for the grounding of Boeing's 737 Max planes on Wednesday. Boeing is facing a test of its notable influence in Washington. 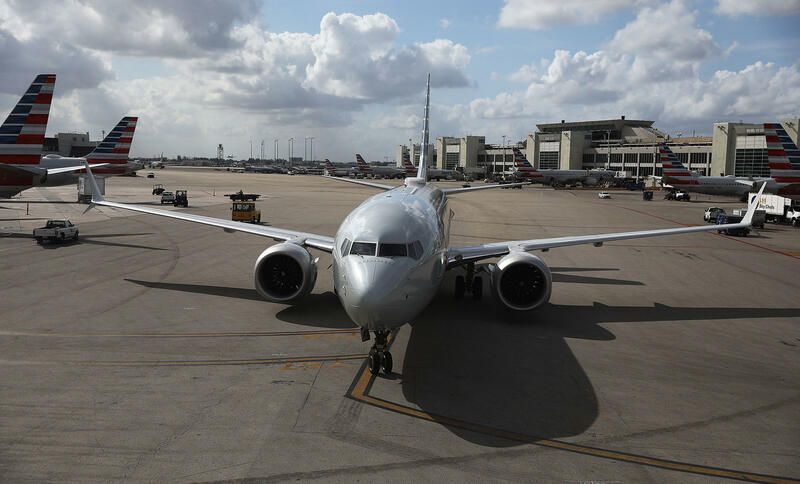 The federal order grounding all 737 Max jetliners in the U.S. comes after repeated assurances from the manufacturer that the planes are safe. Boeing CEO Dennis Muilenburg made that argument Tuesday in a telephone call with President Trump. The call is indicative of the direct line the aerospace giant has long enjoyed with the highest reaches of power in Washington — a connection that is being tested following two deadly plane crashes. Trump had been in office less than a month when he visited a Boeing factory in February of 2017 to celebrate the launch of a 787 Dreamliner. "That is one beautiful airplane," Trump told factory workers in South Carolina. "God bless the United States of America, and God bless Boeing." The president joked at the time about the tough negotiations he'd been having with Muilenburg over a new series of military jets and new 747s to serve as Air Force One. The two haggled over prices in person at Trump Tower and the president's Florida resort. "What it tells me is, one, he cares about business," Muilenburg told Marketplace last month. "And he creates open communication lines." Of course, Trump is not the first president to take an interest in Boeing's business. Former President Barack Obama was also an aggressive promoter of Boeing products, especially overseas. "I'm expecting a gold watch from Boeing at the end of my presidency because I know I'm on the list of top salesmen at Boeing," Obama joked during an export forum. Two months ago, Obama was a special guest at Boeing's corporate retreat and the company made a sizeable donation to the former president's library. For decades, Boeing has worked to ingratiate itself with both Democrats and Republicans in Washington. The company spent $15 million on lobbying last year and $16 million the year before. "It's right up there as one of the most powerful operations in the country," said Sheila Krumholz, executive director of the watchdog Center for Responsive Politics. It's not just Boeing's checkbook that makes the jet-maker influential in Washington. The company is the nation's largest exporter, the second-largest defense contractor, and Boeing employs more than 130,000 people around the country. "This is a blue chip company that lots of government officials have long been proud to be associated with," Krumholz said. The acting defense secretary, Patrick Shanahan, was a longtime Boeing executive. The acting head of the Federal Aviation Administration, Daniel Elwell, used to work for Boeing's trade association, the Aerospace Industries Association. While the FAA ultimately grounded all 737 Max jets on Wednesday, other countries were quicker to respond after a deadly crash involving the plane in Ethiopia on Sunday. It was the second such crash of a 737 Max in five months. Elwell told Morning Edition the agency was waiting for clearer evidence of similarities between the two accidents. Once that became available — through enhanced satellite data and other sources — the FAA issued its order. "We're a data-driven organization," the acting FAA administrator said. "If a link is not made, you don't have a common thread, there is not a need for grounding. So once we got the data, that made that relatively clear." Sen. Richard Blumenthal, D-Conn., had complained on Tuesday that U.S. regulators were dragging their feet. "This responsibility, it belongs to the FAA to put safety ahead of airline profits," Blumenthal told All Things Considered on Tuesday. "This kind of disregard of responsibility undermines people's trust in institutions as a whole — particularly in the federal consumer protection agencies." Boeing said in a statement on Wednesday that it continues to have "full confidence" in the safety of the 737 Max, but supports the temporary grounding, "out of an abundance of caution and in order to reassure the flying public." "Safety is a core value at Boeing for as long as we have been building airplanes; and it always will be," the company added. Now that Boeing is under a microscope, Krumholz said the company will be using every tool in its toolkit, not only to find and fix any problems with its airplanes, but also to keep regulators and policymakers on its side. "When a crisis hits, now is the time that they are undoubtedly happy that they have these strong relationships in Washington," she said. "Because they will need them."